For these families, the virus is raising a different kind of anxiety than the one they have weathered during 13 years of ground war in Afghanistan and Iraq. 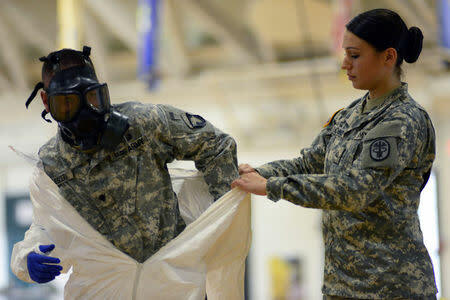 They want to know how the military can keep soldiers safe from the epidemic, a new addition to the Army's long list of threats. 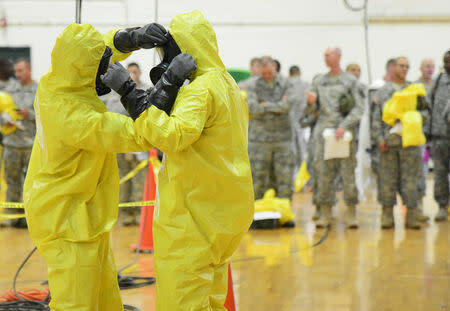 "Ebola is a different problem set that the division hasn't (faced) before," said Major General Gary Volesky, who will soon head to Liberia along with soldiers from the 101st Airborne Division. There are already more than 350 U.S. troops on the ground in West Africa, mostly in Liberia, including a handful from the 101st. That number is set to grow exponentially in the coming weeks as the military races to expand Liberia's infrastructure so it can battle Ebola. 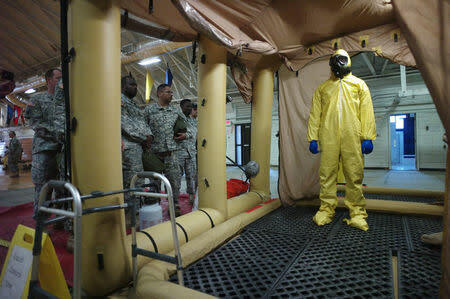 The military has already stood up a headquarters in Liberia's capital, Monrovia, and hopes to have a 25-bed field hospital up and running by the middle of this month. It also aims to quickly build up to 17 Ebola treatment units. Volesky said he has seen more of what he called "stay behind dialogue" after these pre-deployment briefings, something he encourages. "I have two kids ... Of course they're worrying about their dad," Lieutenant Colonel Scott Sendmeyer, the chief engineer now in Monrovia, told Reuters by phone. "At the same time, I've shared the training that I've received with my family ... That's the way I (relieve) them of their fears." Captain Alex Willard, who was undergoing the training, said the West Africa mission was far different than the kinds of operations in Iraq and Afghanistan than many in the 101st "probably are more comfortable with."